When people used to tell me they loved my floorboards and wanted to know what colour they were, I'd be honest and say 'It's dirt! 'Such was the down-to-earth approach of Mary Curran when she was renovating her Victorian dream home in a central Melbourne suburb. 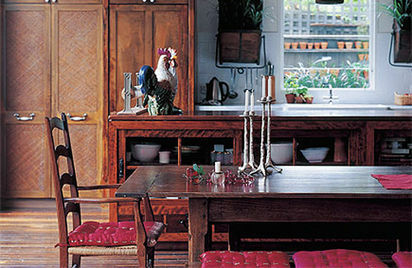 Now, the house that she shares with husband Ben and 15-month-old Stella is unrecognisable - and packed with easy style. 'I went for a plain sofa so I could add accents of pattern and colour with cushions and accessories,' explains Mary. If you've been won over by her dark wood furniture, visit www.lombok.co.uk for similar items. Mary is Irish born, but has lived and worked in Melbourne as an interior designer for several years. Her style covets strong simple furniture, particularly the eclectic mix of French, Spanish and Italian country pieces with Japanese and Chinese design. This unusual combination sits surprisingly well in this renovated Victorian home, which the couple purchased two years ago after only nine months spent in their previous house. 'It was classic Victorian,' says Mary, of the original floor plan. 'There were four bedrooms and the owners had added an extension at the back, which blocked out all the natural light. So, we basically knocked down the entire back half of the house and redid the whole thing.' The renovation took a year to complete and merged the four original bedrooms at the front of the house with a new living area at the rear.